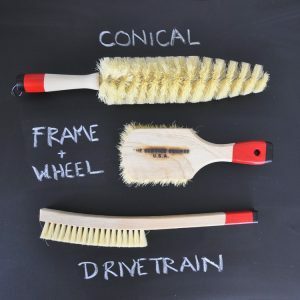 Finally, Australian cyclists can get easy access to the grease shedding convenience of The Service Course’s sustainable, tampico bristle and timber handled cleaning brushes to make cleaning their bikes easier, quicker and more effective. More expensive than plastic brushes, but less likely to drag dirt, grease and grime around your bike as you clean it, making it easier to get the job done and get on with riding. WHAT IS TAMPICO, AND WHY IS IT BETTER FOR BIKE CLEANING BRUSHES? Tampico is a natural fiber made from the Agave Lechugilla plant, which grows in northern Mexico. Natural tampico bristles hold about 65% more water than synthetic bristles, and shed dirt and grease more easily. That means they don’t hold and drag grease, dirt, and grit around your bike like synthetic bristles do. They also maintain their properties over time – tampico bristles don’t harden or otherwise deteriorate with use. They will wear out eventually, but it takes awhile. We’ve been using our initial test set for four years with no signs of slowing down. And they’re made from plants, which are sustainable, and not oil, which isn’t. Synthetics are more widely available and less expensive, but they don’t work as well. Now, instead of paying huge amounts to ship a set of brushes across the ocean and waiting weeks, you can order them here in Australia and have them shipped Express the next day. We’re stocking the full range except for the Original kits – the buckets are cost prohibitive to ship within the USA, so it was never going to be viable to get them into Australia. This includes the excellent Hand and Nail Brush, the utilitarian Scrub Brush and the tough, kit saving Laundry Bags. Check out the range in the shop, or come and visit the tent at an upcoming race! ← Race Day Sales and Pre-order Collection!